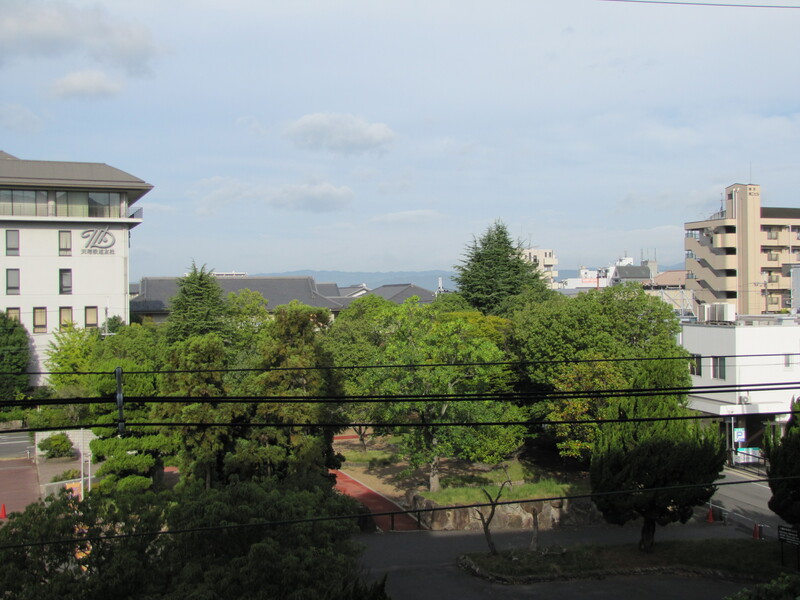 I arrived in Tenri late Friday night, and since then I’ve basically been trying to set up my apartment, unpacking everything and figuring out all those mundane things like cleaning supplies and dishes and kitchen appliances. So in these photos, not everything is set up or necessarily tidy, but please forgive me that. First photo: view from my little balcony. This balcony is not here so much for the purpose of leisure as it is for hanging clothes to dry. Perhaps more on that later. So, the main room is actually more spacious than I would have thought, but then again, it’s not like I’m living in Tokyo or somewhere. 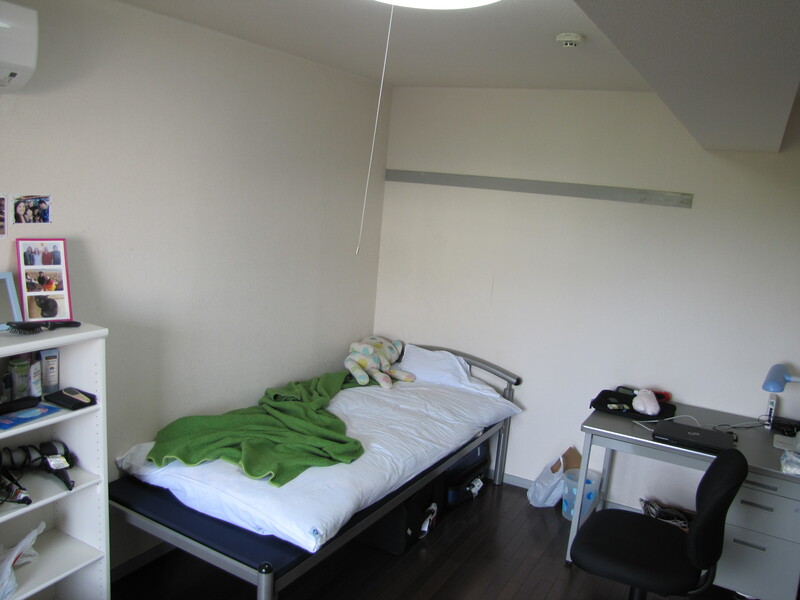 The bed is comprised of a hard mat on the bed frame, a futon and sheet to sleep on, plus a small blanket and comforter. Well, the bed was so hard and it’s still so hot that I basically folded up the comforter and put it under the futon to make it softer. It’s working fine so far, but unfortunately the pillow provided is one of the hard, bead-filled ones that seems to be preferred among asians. I had the exact same problem in Taiwan last summer, so I’ve been using the stuffed bear I bought in Taiwan last year as a substitute pillow. And then there’s the kitchen. It’s tiny. As you can see. 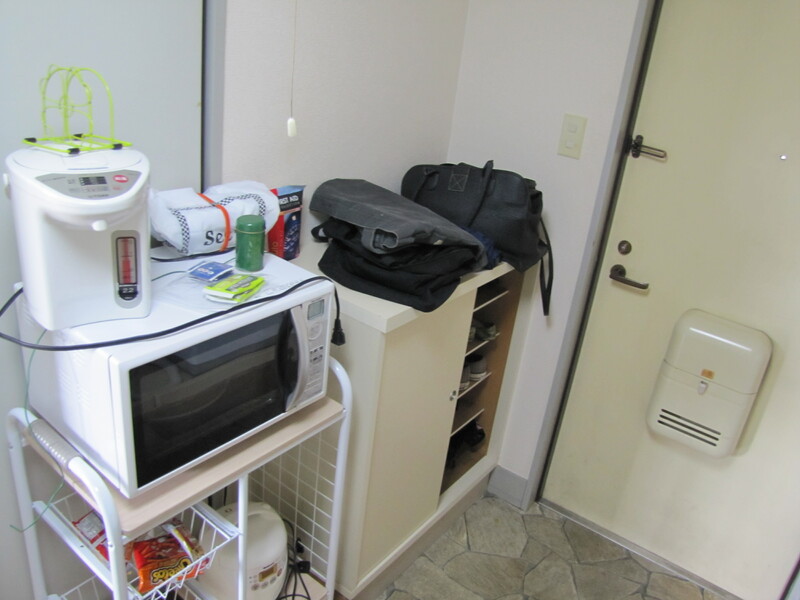 One stove, a sink, a tiny fridge, but across the way there is a rice cooker, microwave, and coffeemaker (I think). 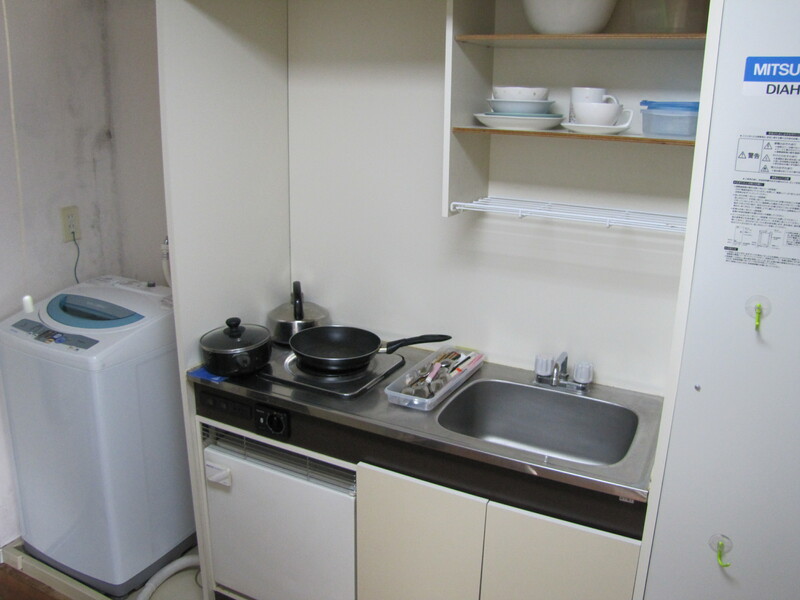 Thankfully, the room came with a lot of dishes and utensils and cooking items, so hopefully there will be no need to buy much more. I made myself breakfast this morning. Very simple: an egg and cheese on a piece of bread with a cup of tea. I didn’t have any no-stick spray, so I had some trouble with cooking the egg, but other than that, I think I managed quite well for myself. This entry was posted in Uncategorized and tagged Japan, study abroad, Travel. Bookmark the permalink. That IS a tiny kitchen! Wow. I don’t know how’d I’d manage with all the cooking I like to do.